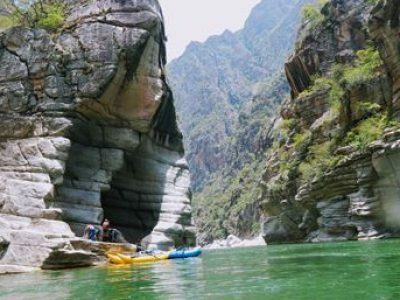 The Apurimac Rafting Tour – The Great Canyon extends through amazing narrow gorges whose depth is twice that of the US’s Grand Canyon. Waterfalls, innumerable rapids, and small brooks disrupt its flow up to level V.
According to the National Geographic expedition, the largest River system in the world, the Amazon River, is supplied by the Apurimac River. What was really important to me was the environmental consciousness of the whole crew. I really recommend River Explorers if you want to have an unforgettable experience with amazing nature, nice guides plenty of adrenaline and lots, lots of fun. Briefing (eve of trip departure): Details of River Canyon, Navigation, Items required and so on. During May, the river is filled with snowmelt as you take a wet, crazy ride along huge holes, waves, and strong currents. From mid-July to November, technical skills are required to maneuver through the rocks and tight channels. After meeting with the tour leader and private van at 8 am in your hotel; we start our four-hour bus trip. A 3-hour breathtaking drive through various Andean villages, mountainous hills, and valleys; on the way, enjoy some snacks and capture the special moments on your cameras. Along the way, there will be a short stop at the Apurimac Gorge to observe the amazing views of 2,000 meters high viewpoint. 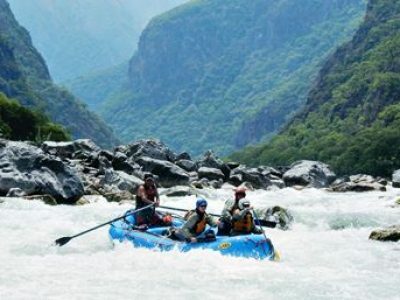 At the Apurimac River, the Apurimac rafting trip will be organized. Before the rafting trip, we will use the dry bags to keep the camp clothes, sleeping bag, and other camping items. Shortly after having a picnic lunch, everyone will come together for a 30-minute briefing provided by the leader. This briefing shows the techniques required for floating, padding, rescue and a few other safety procedures. Next is a short practice session to help you get accustomed to the river. Every passenger swims in Level 1 rapids to know how to grab the cataract or safety kayak, flip the rafts over, secure rescue lines, and more. When the crew, guides, and safety kayak believe everyone is ready, we get down to business – the Apurimac rafting! Everyone will spend one hour enjoying the level II and III rapids with the serenading panoramas of the river gorge. Then we move to the little Z, which is the first level III+ rapid. This section goes up to Level IV in May and beginning of June. Get some adventures in the rapids before finally getting to an awesome waterfall. Everyone enjoys more rapids and awe-inspiring vistas before returning to camp in the afternoon. Our afternoon camp will be on Las Paltas (“Avocados”) which is a sandy beach. You will be shown the solid waste toilet system, camp activities and other things available in the camp. Take your afternoon snack, rest and engage yourself in some soothing activities. The guides will prepare and offer you the first yummy dinner in the camp before giving you a brief of the activities for the following day. As you stare at the lovely sky over your head, our guides relish and share their experiences and adventures of the Apurimac River. Our Day 2 starts at 8 am. Everyone takes tasty breakfast; then, packs our dry bags and tents as we prepare for the day’s adventure. After the rafts have been reloaded, we get into them by 9 am and move through the wilderness of the Apurimac Canyon. Enjoy the astounding views of the canyon as well as the Chute rapids as we move closer to the Portage rapids. At The Portage, everyone disembarks and takes a walk around the place with your dry bags. After passing the Portage, we relax before moving on. We journey through the Minefield gorge, filled with several levels II, III and IV with some breathtaking rapids, drops, and waves. We rest again; assuaged by the spectacular Apurimac River that surrounds us. Our next stop is the Purgatory Gorge, formed by the floods of the Apurimac. Take a deep breath as the scenic landscape of the Purgatory Gorge is spread out right before you. Relax, swim, or jump from a cliff as we wait to enter into the Purgatory, one of the most excellent rapids of the river. After the guides have described the rapids and the safety measures to follow, we raft through the Purgatory and go with the river as it goes into the left section of the gorge. Everyone runs through the rapids until we are all done and then get an extra portage. From here, the river gorge flows into the Vilcabamba River (a rivulet of the Apurimac River). Then we reach Dragons Tail Beach where we take a rest, swim, stroll around before taking the lunch prepared by the guides. After lunch, we take a trip down to The Z, The Roll Over, Las Tres Marias, The Window, and Indiana Jones which are all level IV small rapids filled with picturesque holes and waves. El Trinche (Evil Fork) is our next stop. This big level IV rapid starts with several holes, rocks, and waves and finally ends into an enormous hole. Only the guides are capable of maneuvering here without any challenges. Our next calls are level IV rapids called the Table and No Name rapids. We move into a gorge that has huge rock walls. Eventually, we will stop at the Table Beach camp on the second day. We gather some woods and wear camp clothes while the guides prepare the tents. It is finally the time to rest, swim or hike in the river. Hereafter, the guides will serve you a great dinner. Play under the stars, enjoy more stories and savor the great experiences you have had earlier today. Just like Day 2, our Day 3 begins with an appetizing breakfast before kicking off our journey immediately. There are so many thrills today because the rapids are high and exciting. The first hour of rafting will be in three level IV rapids – Wake Up, the Labyrinth, and Ramona. Ultimately, everyone gets into the biggest rapids of our tour known as You First and The Toothache. Because of the risk involved in these rapids, only the guides can run them, the passengers will only walk. Relive the panoramic landscape of giant rocks that stand as tall as 1,000 meters above the river level as well as a unique 200-meter waterfall. Then we take our journey to Babaluba rapid, the level V. Here, we will set the safety kayak to flow through the rapid, followed by the luggage boat. A good location will be found for the guides and kayak, and then the boat of the passengers will run the rapid. We move from small channels with lots of rocks into holes and drops where the boat maneuvers technically in a nerve-racking manner. We relax for a few seconds and then move to The Last Laugh rapid, level IV, which combines a sequence of class II, III, and III+ rapids. As our adventure comes to an end, we will get into a private bus, have lunch and drinks and take a 2-hour journey to Cusco. We will alight in Cusco and relive every moment of our encounter through a video played on a pub’s large screen. Combine our Apurimac 3-day adventure with other tours to Machu Picchu, Inca Trail Tours or any other tours for a once-in-a-lifetime experience. Professional English-speaking river rafting guides, certified in Swift-water rescue and in Wilderness First Responder. State-of-the-art rafting equipment including self-bailing rafts, hi-flotation life jackets, helmets, dry bags for personal gear, paddle jackets, , and special containers for cameras. Doubletents, safety and professional river system navigation, private round trip transportation, video and picture service. Complete first aid kit, including disposable resuscitator (CPR Bag Valve Mask). Meals, we include 2 breakfast, 3 lunches and 2 dinners. Our meals are carefully planned to fit the needs of everyone. All the meals can be made vegetarian or vegan, you just need to inform us of your dietary needs with at list one week before the tour departures. Sleeping bag (may rent for $15 per trip), inflatable mattress (may rent for $15 per trip). Camping: Sleeping bag rated to Comfort 10 °C during May to July and 20 °C between August and October (sleeping bag may rent for $15 per trip), inflatable mattress (may rent for $15 per trip). Rain jacket, comfortable tracksuit pants (avoid jeans or cotton pants), shorts, 2 T-shirts; A warm fleece jacket or jumper, thermal long sleeved top and pants, two par of wooden socks, runners or sandals (trekking heavy boots are not allowed. Head flashlight (plus spare batteries), tooth paste and tooth brush, money to use during the driving on the day one and two, any medication that you may need. The Apurimac rafting tour is carefully designed to provide fun and especially a safe trip. Our main concern after safety is to look after the environment. We work every day in an effort to prevent pollution and contamination. Fauna: Fox, giant river otters, condors, deer, variety of birds and — if we are really lucky –puma! Garbage disposal: All inorganic matter is returned to Cusco, including all human waste (transported by means of cargo boat). This section is open during the dry season (May to November). Our departures dates are flexible, we need only 2 persons to open a tour. Therefore, just pick up a date and let us know.